Friends of East Goshen, Inc is a 501(c)(3) that seeks to improve the historical, recreational, educational and environmental conditions in East Goshen Township and the greater Southeastern Pennsylvania Region. 1) Saturday April 20th­­, 2019 at 10am – Annual EGG HUNT! 2) Saturday, June 29th, 2019 from 3pm to dusk – East Goshen COMMUNITY DAY! 3) Saturday, October 19th, 2019 at 10am – Annual PUMPKIN FESTIVAL! 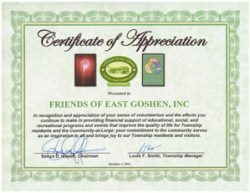 The Friends of East Goshen, Inc., (FOEG) was incorporated in 2013. As a non-profit 501C3 corporation, FOEG in recent years has assisted the Township and the Park and Recreation Department by raising funds through individual and business contributions that are tax deductible. This fundraising activity has enabled the Township to hold all of its events at East Goshen Park at no cost to the participants. The Friends is operated and directed by an all-volunteer Board of Directors. Almost all of the moneys raised and donated are used for the operation of the major Township events. Only costs for marketing materials are taken from these funds. FOEG annually raises more than $35,000 from local contributors. More than 30 percent of individuals and businesses solicited make a contribution. The Friends of East Goshen will, through the solicitation and acceptance of funds, grants, and other gifts in kind, provide support for the preservation, improvement, and restoration of township parks, recreational facilities, open space, historical resources, and activities. This includes financial support of educational, social, and recreational programs and events designed to improve the quality of life for township residents and the community at large. Senya Isayeff, Chairman and Louis Smith, Township Manager recently presented this Certificate of Appreciation to the Friends of East Goshen for outstanding service. President, Joe Bove received the accolade and passed it on with good wishes to the board. FOEG has set some ambitious goals for 2017 and 2018. Future recreation projects in East Goshen look promising. The 23rd annual Easter Egg Hunt will take place on Saturday, April 20th. There will be more than 10,000 eggs for the children to collect. The Easter Bunny will make his grand entrance courtesy of the Goshen Fire Company. The event will feature Goshen donuts and hot coffee, just right for a cold spring morning. The fun will begin at 10:00 AM. Please have your kids in position for the fun. Check your eggs because you could win big prizes if they have special markings. This event attracts some 1,500 people. Saturday June 29th, 2019 from 3pm to dusk is the annual Community Day! The highlight of this township’s events calendar culminating the best fireworks display in Chester County. Plan to attend the Pumpkin Festival on October 19th at 10:00 AM. This event will feature hay rides, a drawing contest for kids, a family pumpkin carving contest, frozen turkey bowling, a petting zoo, and pony rides. In addition, there will be free pumpkins for the kids, a raffle for the GIANT pumpkin and Farmers’ Market vendors. Be sure to enter the pumpkin pie eating contest. Over 2,500 people attend this event. Plan to attend the Tree Lighting on Friday December 13th, 2019 at 6:00 pm. This event, designed to put the entire family in the spirit of the season, features a visit from Santa, caroling, a dance performance, and the announcement of winners of the house decorating contest and the canned food drive for the West Chester Food Cupboard. The kids will also have an opportunity to visit with Santa. Donate Today to help sponsor township events! Contributions received from local residents and businesses support the major events put on by East Goshen Township each year. Donations ensure that these family-focused activities will continue year after year at no cost to the participants. Interested individuals and businesses may donate through monetary contributions or through donations-in-kind, which include property, stock, art or other valuables. All donations are tax deductible and can also be made on this website through Pay Pal. Remember that having fun together is a great way to start a relationship. Attending and supporting these events offer a great way to meet other Township residents and business owners in East Goshen. FOEG plans to expand its marketing activities to attract additional interest from local residents, as well as from area businesses. John “Jam” Jamgochian is an Associate Broker with REMAX Preferred in the East Goshen Township office and has been active in real estate since 1990. He was active on the Park and Recreation Commission for the past few years and now serves as both Treasurer and Secretary of FOEG. He has been active in marketing FOEG activities to local businesses recently. I became a resident of East Goshen Township in 2013, downsizing after spending most of my life in the Borough of West Chester and a few years in Caln Township. I am a graduate of Moore College of Art in Philadelphia and was a graphic designer for over 30 years. I retired from my second career in 2013 after 20 years as an Administrative Assistant and Membership Coordinator at the Kennett Square Golf and Country Club where I now do graphic design work part-time. I joined a walking group in our park, met Jason, and made some great new friends. My daughter and son-in-law live in Philadelphia with their 7-year old daughter, who I have recently introduced to our amazing new playground! I look forward to being part of the Friends of East Goshen and “giving back” to the community, especially to our wonderful park. A twenty-year resident of East Goshen Township, Michael Herron’s professional career focused on developing and managing strategic communications programs for public and private organizations. Prior to retiring, he served as the Executive Director for the Transportation Management Association of Chester County, Mr. Herron served as chief communications officer for several companies including SEPTA, Roy F. Weston and Interdigital Corporation. Mr. Herron holds a master’s degree in communications from Temple University and an English degree from St. Joseph’s University. © 2019 Copyright Friends of East Goshen.